Hi Everyone - back again with another card tutorial, this time for Simon Says Stamp. This card was made using the Card kit inspired by Tim Holtz that features an exclusive stamp set put together just for SSS. 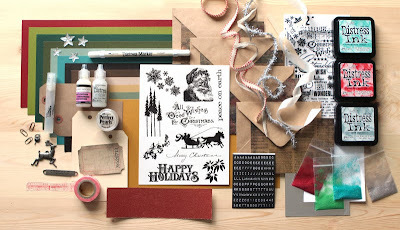 Loved that the kit came with the 3 holiday Distress Ink pads, including Iced Spruce which is new to me. A real gray green just like a Spruce tree now that I think of it! So if you would like to see the card I made using the kit and the new Christmas Bells Bigz die, pop on over to Simon Says Stamp for a look. Hopefully it gives you a few ideas to get in the creative holiday spirit! Time to dig out the Christmas dies, stamps and ink pads and get creating. You still have time! Hi Paula! Absolutely love your card and commented at SSS but your link here didn't work for me? thanks all the way from South Africa, Belinda....the link is fixed...appreciate it. So pretty! You've been one especially busy gal lately! LOVE THIS - saw it at simonsays - you have talent my girl! not to mention an enabler .... now I NEED more things! I went to the Simon site but did not see you card. I might have just missed it somehow. On my way to SSS.... Iced Spruce is one of my favorites!